Smoothies play a big part in the lives of the Peck & Chisel team. We share breakfast smoothie recipes, discuss the latest cert food ingredients and debate over kale vs spinach as a smoothie base. But while reading one of our favourite food blogs, thekitchn, we were hit by a shocking revelation. We have been making smoothies all wrong this entire time! No matter what type of liquid you’re using — dairy or non-dairy milk, juice, coconut water, tea, or coffee — let this be the very first ingredient you add to the blender. Keeping the liquids on the bottom allows the blender to create a “vortex,” easily pulling down the greens, fruit, and veggies that are layered above. Remember, the amount of liquid used will determine the consistency of your smoothie. 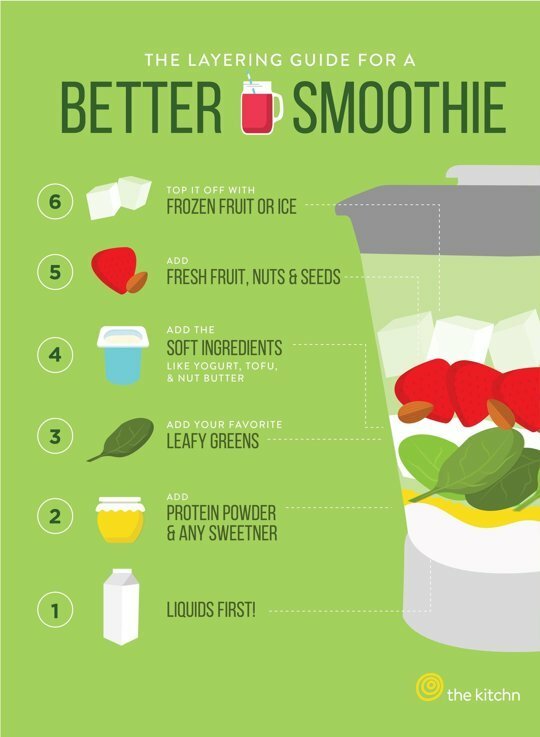 Less liquid will make for a thicker smoothie, while more liquid will give you a thinner drink. If you’re using any type of protein powder, boosters like maca or cacao powder, or a sweetener like agave or honey, add it immediately after the liquid base. It’s important that these ingredients are well-blended, and in the cases of any powders, totally dissolved in the smoothie. Protein powder can make smoothies especially thick and creamy. But when added to the blender last, they might not get completely dissolved, leaving an unpleasant powdery or chalky texture. Next up, bring on the leafy greens. Keeping kale, spinach, chard, and other leafy veggies at the bottom of the pitcher is a smart way to make sure they get blended well. Remember to remove any ribs or woody stems! Bonus Tip: Pause for a Pre-Blend! Before adding the next round of ingredients, give the smoothie a quick pre-blend after adding any greens. This is one ingredient that can take a while to break down, so it’s helpful to give leafy greens some extra blending time. From here on up, ingredients will be added to the blender based on firmness, starting with soft ingredients. This layer will include things like yogurt, tofu, and nut butters. Drop in soft fresh fruits, like berries, melon, citrus, and avocados, as well as nuts and seeds. To help fruits blend better, consider cutting them into chunks. This is especially helpful if your blender isn’t very powerful. Finally, top off the blender with hard ingredients, like frozen fruit and ice. The weight of these heavier items helps to push the other ingredients down toward the base. Time to blend away and serve!